You’ve maybe noticed that I haven’t been around this here blog much lately – partly because I’m been busy over at www.cleanbinmovie.com – but that doesn’t been I haven’t been thinking and doing zero waste. Case in point: one of my very good friend recently had a baby shower. No, I didn’t push my mandate on the hostess . . .she was right on board, and it worked out really well! Dishes: I have a case of wine glasses (a souvenir from my cousin’s backyard wedding) that I keep in a kitchen cupboard for events, and her Mom rented real plates for only a few dollars that could be returned dirty to the rental company, making cleanup super easy. 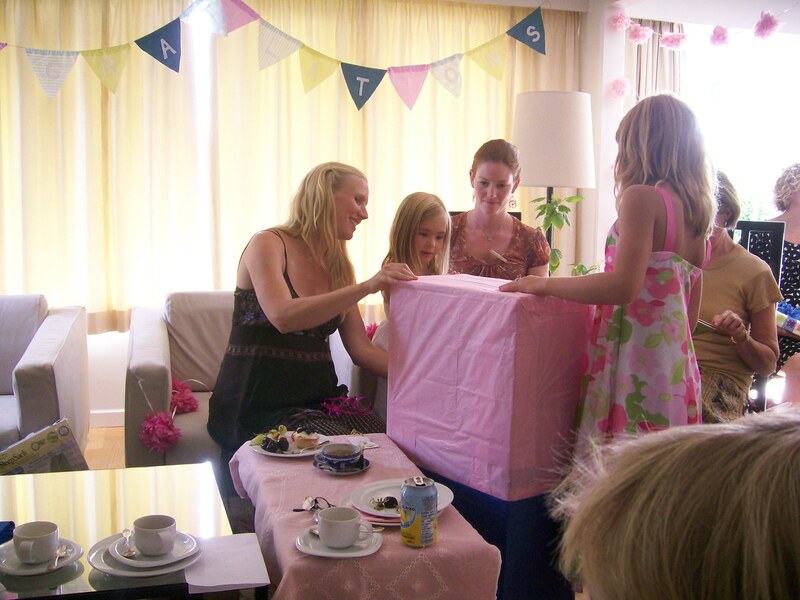 Games: Yes, yes, what is a baby shower without games? One of our friends planned this portion, and she managed to avoid gimmicky plastic oriented shower games altogether! We had to remember baby animal names (anyone know the technical term for a baby monkey? ), guess the circumference of the Mom-to-be’s belly (with compostable cotton string), and guess the number of jelly beans in a baby bottle (which was then given to Mom as a gift). We also had a clothespeg game with wooden clothes pegs which the guest of honor took home for her new clothesline. Decorations: This was my category, and I manged to do it DIY (and free). Grant had photographed a wedding that week, and the bride had handmade hundreds of pink tissue paper pompoms. I knew the sister of the groom well enough that I could ask about whether the decorations were headed to the landfill. Turns out that the bride was ecstatic that her creativity would be given a second life at the shower, so I went home with a pack full of pompoms. To balance the overwhelming pink theme, I also made a couple of fabric banners (way more time consuming than expected) out of scrap yellow, blue, and green fabric I got at the free store with the word “congratulations” in felt letters also made from scrap. The decorations were snapped up after the party for yet another shower. Wrapping Paper: Ak! There was a lot of it. All I can say is that we salvaged what we could for reuse, and recycled some, and luckily there weren’t too many plastic bows or that sort of thing. Gifts: My lovely friend is the practical sort, and I have to give her A+ because this was the first baby shower I had ever been to where second hand gifts were given the ‘ok’ right on the invite. She ended up receiving loads of lovely, quality gifts (some new, some preloved) that I think she will really use. So cute, aren’t they? I was so stoked about how my “bee booties” turned out that I promptly made two more pairs (with different designs) for future babies. So truly, it was a group effort (with double points awarded to the Mom-to-be’s Mom), and we really did produce hardly any landfill garbage. Whether it’s because of thrift or concern about waste, if you have more ideas on how to do a low impact party, please put them in the comments! Great Piece! I love it! Definitely will try to keep this somewhere where I’ll remember it for future events. Thanks Jen! I always wrap my gift in a baby receiving blanket. I don’t know if people still use regular cloth diapers that take diaper pins, but I always secure the whole thing with them.